Visiting the library is part of the regular programme for all classes. Pupils come to inform themselves about specific themes that they are currently learning in class, or to borrow books to read in their spare time. Naturally, the librarian advises the children so that everyone goes home with a suitable book. In order to provide children with an opportunity to share their reading experiences with others, the children are given a chance to present their books to the other children. 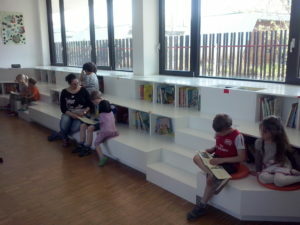 We like to use the area primarily intended for kindergarten students to do this, since the shelves here are laid out so that one can easily sit on them, making it a comfortable space even for a large group of students. 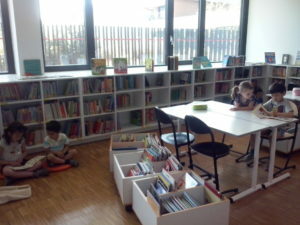 Of course, this room is also good for reading to the children – for what can be better than just sitting back and being immersed in the world of a good book?